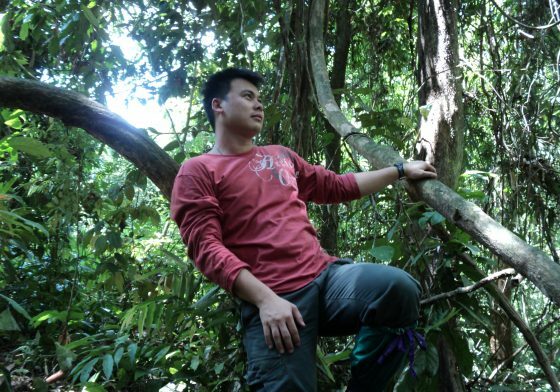 Yeong Kok Loong, also known as ‘Benny’, is a Postdoctoral Research Associate based at the South East Asia Rainforest Research Partnership (SEARRP), Malaysia. He received his PhD degree in Forestry from Universiti Malaysia Sabah (UMS) in November 2015. His first postdoctoral position was awarded by Prof. Jane Hill of the University of York on an Urgency Grant from the UK’s Natural Environment Research Council (NERC). This project aimed to examine the ability of fragmented tropical forests to regenerate and assess the long-term sustainability of rainforest fragments. He then was awarded a two-years postdoctoral research position from SEARRP in November 2016 as the Lead Researcher for the biodiversity component of the Socially and Environmentally Sustainable Oil Palm Research (SEnSOR) project. The project seeks to test the impact of palm oil certification, specifically the Roundtable on Sustainable Palm Oil (RSPO) Standard, in delivering environmental and social sustainability. Benny’s research focusses on maintaining and enhancing regeneration capacity as well as ecosystem functioning of tropical forests, including those that have been logged and fragmented that are located within oil palm landscapes. The idea of enhanced weathering as a geoengineering solution to climate change and, improve plant growth, productivity and resilience had interested him to work at the LC3M. Working with LC3M will see him expand his collaboration links amongst scientists, within and outside the UK, to develop the science that underpins sustainable and economically viable growth of oil palm industries.